Agriculture has been fundamental to Amish society, dating to their origins in Europe. Farming remains important to Amish today. Yet in recent years, an occupational shift has taken place in Amish society. The farm has always been important to Amish, for a number of reasons. Most Amish, even those who do not farm, consider it the ideal occupation. Farming allows families to work together, and fathers to be at home. Working together allows parents to pass on values of hard work, husbandry of resources, and frugality to children. Additionally, Amish see a Biblical injunction to farming, seen in frequent references to agriculture in Scripture. Farming allows a degree of separation from the world, with minimal influence from non-Amish society. Amish farms may be visited by the occasional feed salesmen or the milkman who might make his rounds every few days. But most Amish farms allow Amish to maintain distance with the non-Amish world. 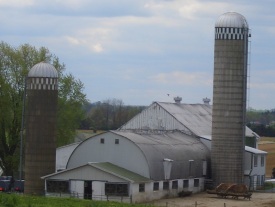 Farming also allows Amish to practice communal inter-reliance, seen in such practices as the silo ring or barn-raising. In recent years, land pressures have made it much more difficult for Amish fathers to provide farms for all of their grown boys, as has been the tradition. Amish have a high growth rate, with 6-7 or more children, with the vast majority choosing baptism in the Amish church. This has led to growing populations and increased demand for land. Some Amish, such as those in Lancaster County, live in close proximity to highly populated areas. Development pressure has also caused increases in land prices. Farms which were at one time affordable have risen to one million dollars or more, putting traditional dairy farming out of reach for many Amish. Amish fathers have found providing a farm for each son impossible. Some Amish have reacted by moving to Amish communities where land is cheaper or by starting new settlements in new areas. Others have sought employment elsewhere. In some communities, such as Geauga County, Ohio, or Nappanee, Indiana, the local economy has provided numerous employment venues. In these communities, high numbers of Amish work in local manufacturing plants. In northern Indiana, home to a large RV industry, many Amish work to produce recreational vehicles, (which, somewhat ironically, most would not own themselves). In other communities, Amish work in mobile home or door factories, as is the case in Homes County, Ohio or Arthur, Illinois. “Carrying the lunchpail”, as the Amish call working away from home in a non-Amish factory, does allow Amish to make a living in a manual labor environment. Many of the factories which employ Amish do not require high school education or its equivalency, which suits the eighth-grade-educated Amish well. In some instances Amish can actually make quite good wages, as has been the case in the RV plants of Elkhart and Lagrange Counties in Indiana. 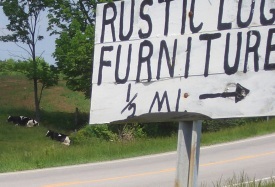 At the same time Amish see drawbacks to working away from home. These include the non-Amish environment and resulting greater exposure to non-Amish influences. “Working out” also means that the father is away from home for 8 or more hours per day, leaving the mother solely in charge of the children, with the burden of teaching and disciplining falling more squarely upon her. In some cases, Amish have frowned upon the high levels of disposable income that have resulted from such jobs. Amish worry over changes in traditional lifestyles and an emphasis on consumption. Carrying the lunchpail is one option popular in numerous Amish communities. However, most Amish see it as less than ideal. Alternatively, many Amish have set up small businesses in recent decades. At one time, the only businesses in Amish communities were those that fulfilled Amish needs, such as carriage makers or harness shops. Later, businesses arose to provide horse-drawn equipment, as the larger economy shifted to using tractors and other mechanized farm equipment. Tapping into craftsmanship skills honed on the farm, Amish construction crews came about as well, along with furniture manufacturers. Three or four decades ago, there were still relatively few Amish-owned businesses. In the ensuing years, Amish craftsmanship has grown in popularity, and Amish furniture, for example, has become nationally recognized. Amish businesses began catering to a largely non-Amish clientele in many cases, with harness shops, machine shops, and other manufacturers producing products for an “English” market. Today, hundreds of Amish shops dot the landscape in the larger settlements, and in some cases Amish businesses reach a nationwide market. At-home businesses are seen as advantageous in that they allow fathers to be with the family. Like the farm, they provide a place for children to work and learn skills and values important to the Amish. 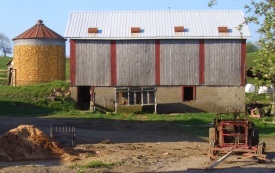 Not all Amish businesses exist at home—carpentry crews and market stands are two examples of “remote” businesses—but in many cases the at-home business is seen as a good substitute which provides a similar dynamic to that found on the farm. Regardless of the location, owning a business allows an Amish person a degree control over one’s environment as well as the people one deals with, including clientele and employees. One drawback of business in some Amish eyes is the increase in wealth and disposable income that has resulted from business success. Some fear that this may serve to unbalance Amish society, creating separate “classes” of businesspeople, landowning farmers, and day laborers. As in the case of factory income, others worry that an increase in spending power will encourage too much consumption and distract Amish from more important matters of faith. Amish scholar Donald Kraybill has noted that the shift to business has been the most consequential change in Amish society in recent decades. It remains to be seen how high Amish involvement in business will affect Amish society over the long haul. How many Amish still farm today? The percentage of Amish farming has dwindled in some communities. In both the Holmes County, Ohio, and northern Indiana (Elkhart and Lagrange Counties) settlements, the number of full-time Amish farmers is below 10%. This number is higher in Lancaster County, perhaps comprising a quarter of Amish households. In smaller, more isolated communities where land is cheaper, more Amish are likely to farm. But in the larger settlements, due to population pressures, the trend has generally been towards decreasing numbers of farmers. One growing trend among Amish, however, is produce farming. Produce can be grown on just a few acres, versus the 80-120 acres typically needed for a functioning dairy. Produce farms rely on intensive cultivation and are highly labor-dependent, which fits the Amish demographic well. The appearance of produce auctions, where local and even out-of-state buyers acquire Amish produce for their stores, has provided a ready market for the output of small Amish farms. Auctions occur regularly at Leola and New Holland in Lancaster, Ethridge in Tennessee, and in Holmes County, Ohio at Mount Hope, among other locations. Produce co-ops have been formed in places such as Lancaster County. Some of these co-ops distribute organic produce, a market which the Amish have also been entering in recent years. Organic farming is another avenue Amish have increasingly been pursuing. Contrary to common belief, most Amish farms are not organic, with Amish farmers using fertilizers and pesticides to achieve greater yields. Yet a growing contingent of Amish is producing organic milk and produce, attracted by higher prices and increasing demand from a health-conscious public. Higher prices means more can be earned by producing less, thereby reducing the amount of land needed to sustain a farm. 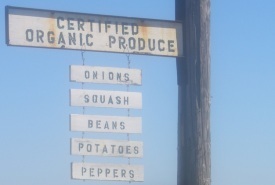 It takes about three years for a farm to be certified as organic, which is one obstacle to entry. Another is the fact that new ideas such as organic farming take time to be accepted by Amish, who put a lot of stock in traditional practice. Ironically, while seventy years ago, all farms were “organic”, the Amish have used chemicals for many decades, thus making the chemically-treated farm the status quo. Farming, though it is only practiced by a minority of Amish today, remains a highly respected occupation. Amish see their heritage as being founded on farming, and farmers themselves are admired in Amish society. In some communities, farm ownership is even required to be considered as a candidate for the ministry. Farming has been supplanted in many communities by alternative occupations, such as factory work or various forms of entrepreneurship. Though it is likely that farming will remain a minority occupation, Amish efforts in developing production for alternative markets, such as labor-intensive produce as well as organic products, are one sign that there may be a resurgence in farming among Amish. Regardless of what specific shape Amish agriculture may take in the coming years, Amish will continue to do what they have done throughout their history—innovate and adapt in order to make a living in less-than-perfect conditions. 2 responses to Do all Amish farm? I am alarmed when I see condos and townhouses on what was once farmland. I notice more and more every time I visit the environs north of Reading near Kutztown, Virginville, Topton, Krumsville, etc. I did read where the “green” movement would start returning people to the farm and I know personally, relatives, who are actually joining a coop in a reduce carbon footprint venture that reminds me of the communes of the 60s. Leave a reply to Do all Amish farm?